The last time I showed you guys my entryway it was in need of some major love. I could’t decide what piece of furniture I wanted to showcase and it needed some serious color infusion. Well I’m happy to report that a long weekend did just the trick in getting this space completed. My favorite part is the painted front door. The color is Bottlenose Dolphin from Valspar that I picked up from my local Ace Hardware (it’s a paint and primer in one). It’s the same color I used in my sun room. I just lightly sanded the door and used a 2 inch angled brush to apply the paint. 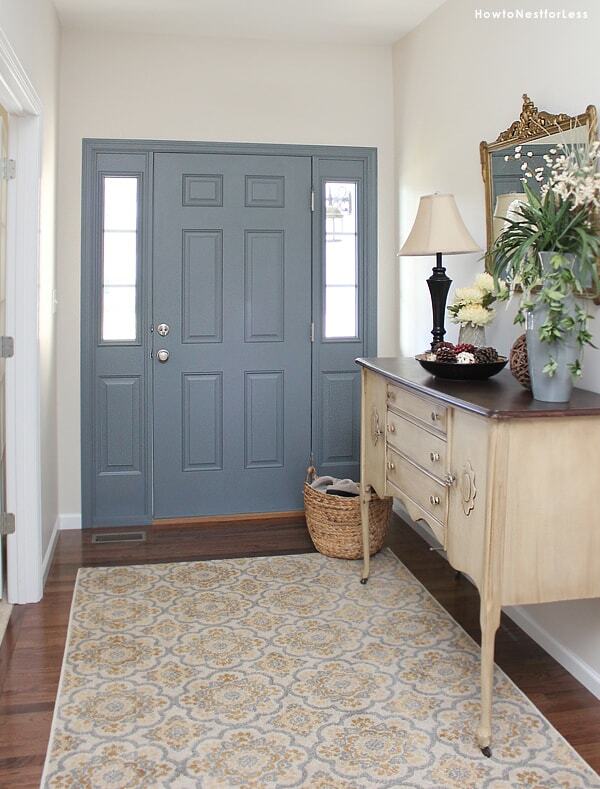 What I love most about this color is that it changes throughout the day, varying the depths of the gray and blue tones. 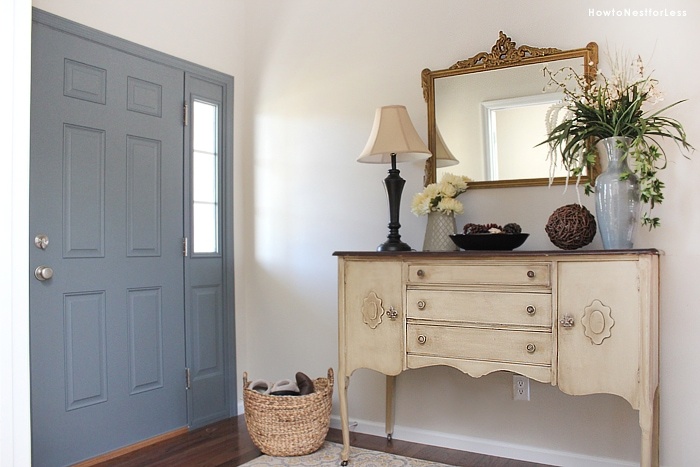 The other major addition to my entryway is this painted buffet that I scooped up from Red Posie, my favorite antique, furniture, and paint store. 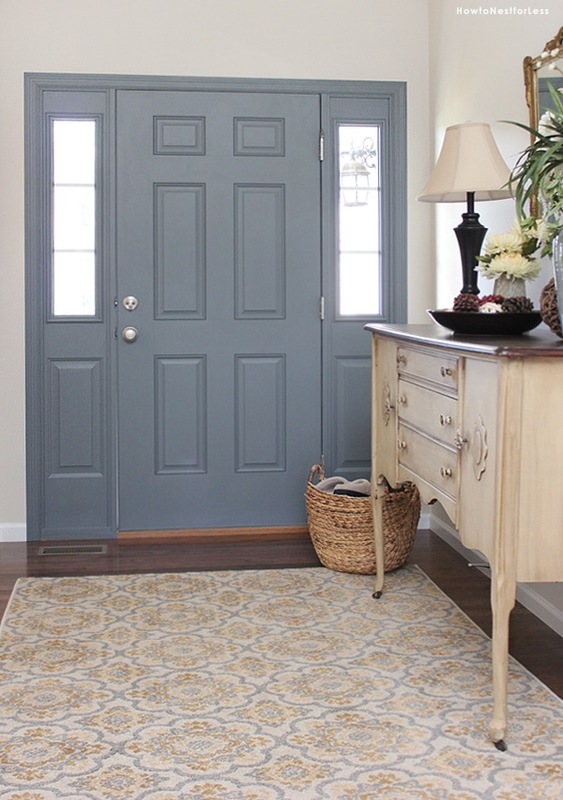 The buttery yellow color is the perfect complement to blue gray tones in the front door, plus the dark wax in the yellowish paint just makes it extra dreamy. I picked up this medallion rug from Target. Totally just stumbled upon this on a whim. 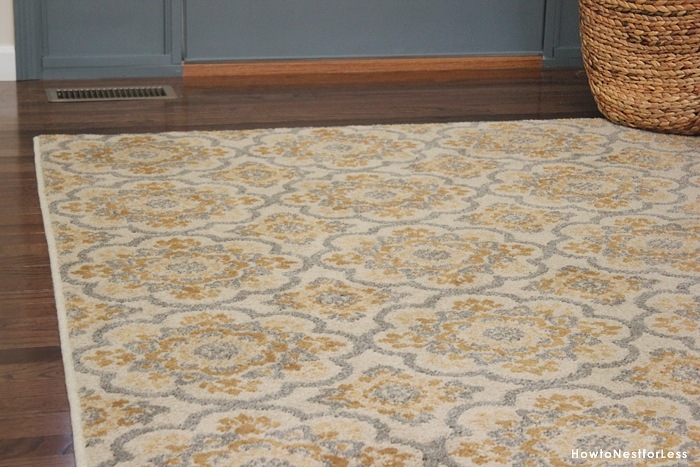 The 5×7 rug was only $80 and seriously completed the space. 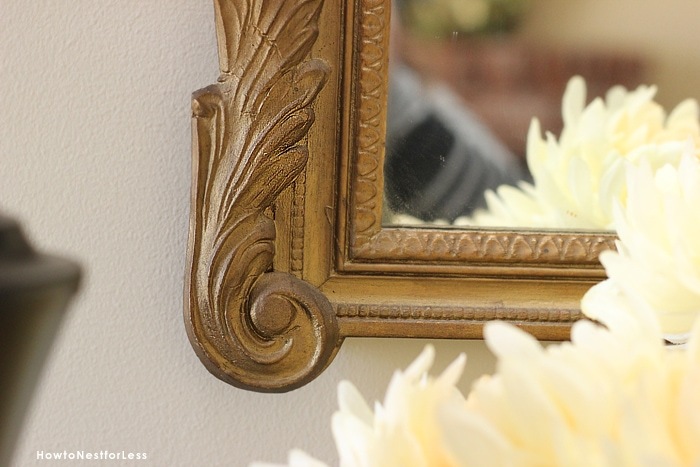 The mirror above the vintage buffet is also a big score from Red Posie. The detail on this is just beautiful. And I’m a sucker for anything in a gold tone these days. So that was my Thanksgiving 4-day weekend project. Even though it only took me about 2 hours to paint the door. Did you get anything done on your to-do list? That looks so great! If you gave me 4 years to consider makeover options it would never have occurred to me to paint the inside of the door. Probably why you’re an ace hardware blogger and I’m not :). Ha! Thanks. Ben thought I was crazy at first. Like who paints the inside of their front door?! Really? People in the US don’t paint inside their front door in colours do you mean? I am shocked tbh lol In the UK everyone paints their doors all sorts of colours. Just another little difference between the two countries decorating habits I guess. Some people do, but you really don’t see it very often! If you ever run out of spaces to decorate, come to my house! I love your style but I always second guess my ideas. Hah, thanks Jennifer! Don’t second guess though. You can always repaint something, right?! Awesome makeover. 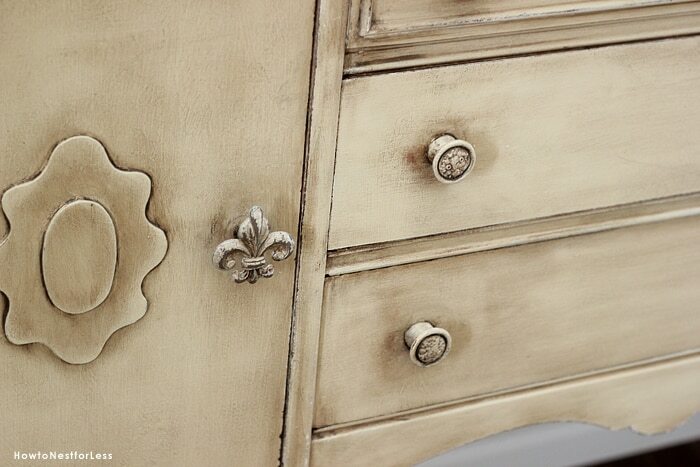 Love the buffet – especially the fleur de lis pulls on the doors. Did those come with it or did you add them? Thanks Judy! The pulls came with the buffet. I adore them too! Oh! I absolutely love your new entry way. You have the same door as I do, and I am going to paint mine just like yours. Sure hope I can find the paint. 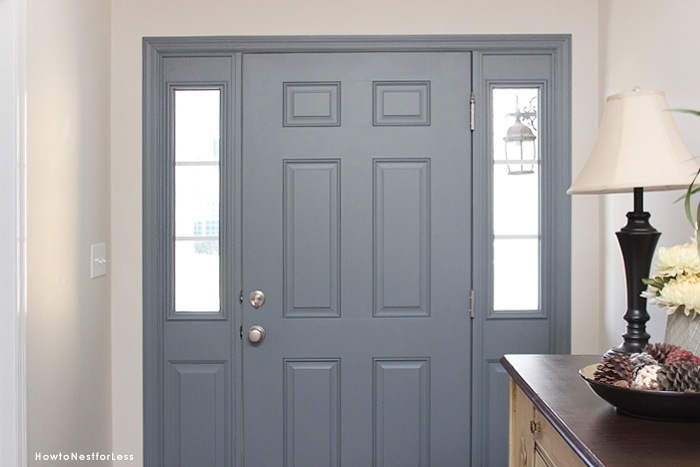 I have been considering painting my door way for quite some time, but wondered if I could just paint the inside and not the outside. Is that what you did, or did you paint both sides. Love, love, love it, and I can’t wait to make mine look the same. I just painted the inside. The outside was already black. Just make sure you tape the sides really well, unless you’re going to paint them too! Erin, very nice!! Paint really can make a big difference. Once again, why did I not think of painting the inside of my front door blue? What would we do without you Erin? I agree with you all- I never thought to paint the inside of my door. Yes, I have seen the decorators who paint the front and the back the same but my front door is RED and my Living Room is in Blues and white. So here I come Ace. 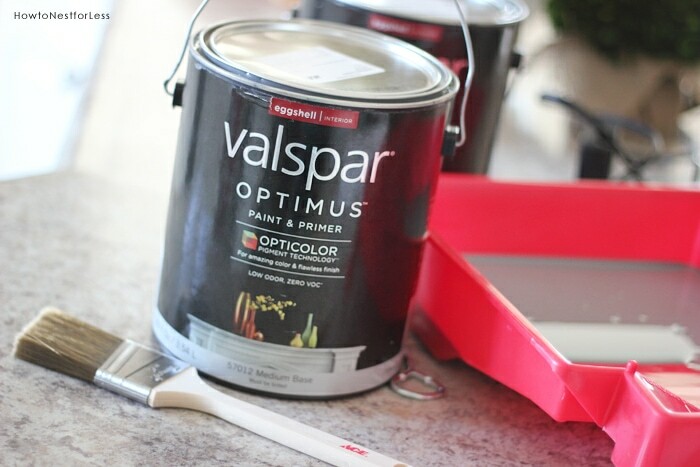 I want that paint! Wonderful job- you have such great ideas. Absolutely beautiful! You totally rocked it! Oh my God! I’m in love with it! My daughter just said she wished our house looked like that! Me too! Makes me want to get rid of our fish tank and do over our entry way! Although our one fish left would half to find a new home!! And I love the flower arrangements too! So when are you available to come so my house?!! Thanks Nichole! And yes, their prices are insanely reasonable. That piece was less than $300! 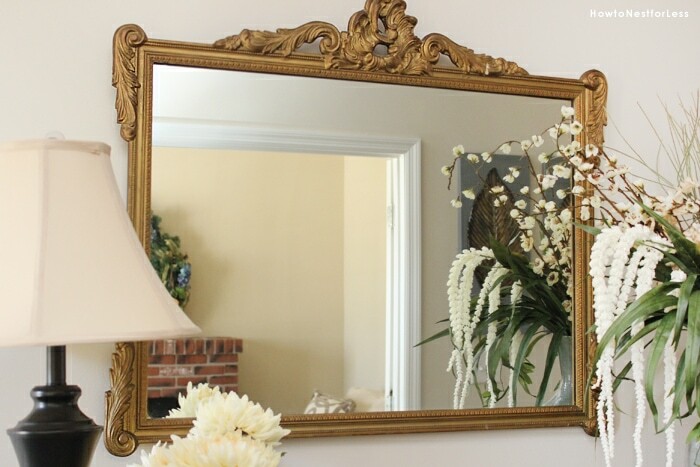 By just making some simple changes it really shows you have such a gift for decorating. I never would have thought of painting the inside of the door. LOVE it! I really need to paint the inside of my front door. Would you care to assist? I mean, you’re clearly a pro. 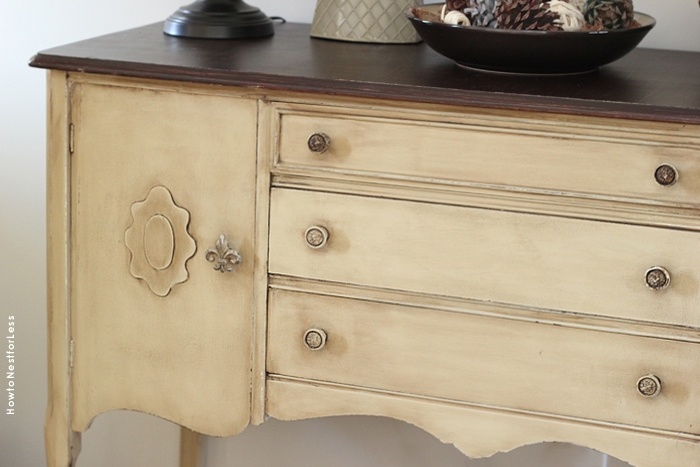 What a gorgeous transformation – I absolutely love your buffet, so beautiful! Wow, this is gorgeous. 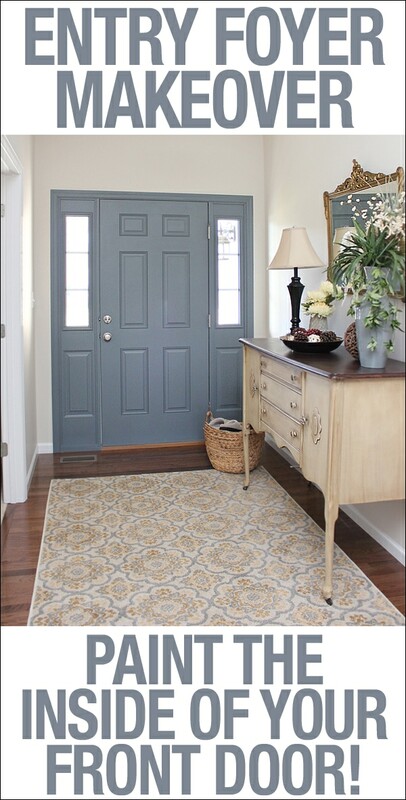 I love the door color and I love the rug. Do you have any idea if this rug is still available from Target? I searched online and was not able to find it. Unfortunately I was unable to find it online as well. Sorry! I really love this color! 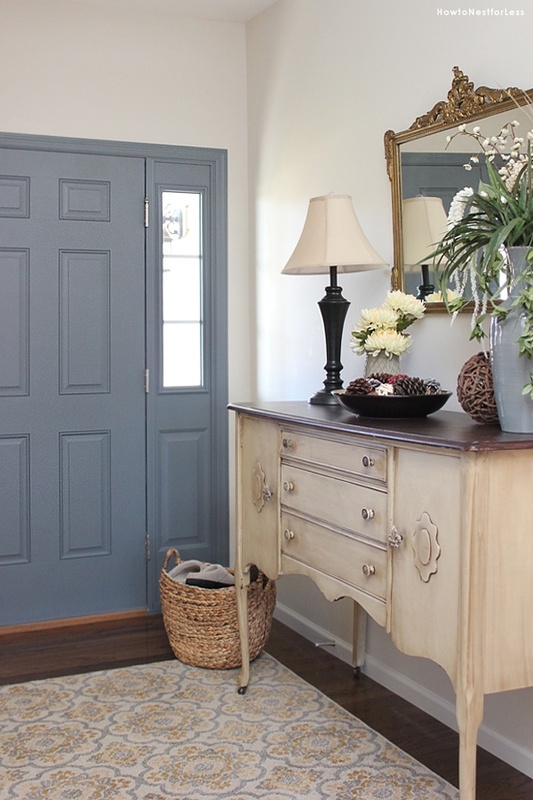 I have used Valspar’s Smoke Infusion and Winter in Paris many times, which are lighter versions of blue-gray, so I love knowing there’s a dark alternative too. Might be good for an accent piece of furniture! 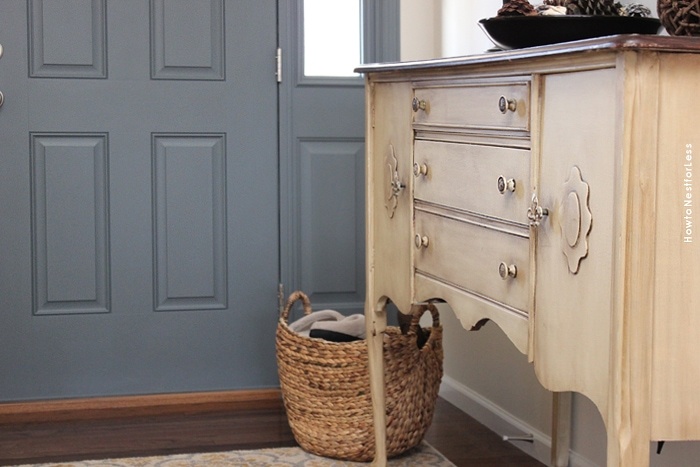 I love the buffet color .. Could you please give me the name of the paint colors and over color you used and the paint brand! Thank you! Thanks Erin! 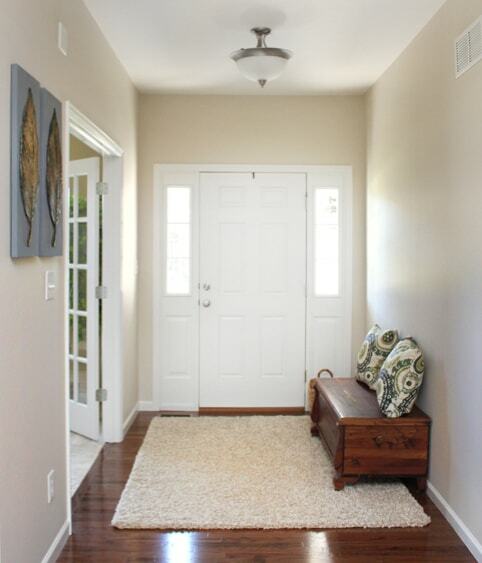 The entryway is lovely. I don’t have the space for such a lovely vignette, but the colors are exactly what I was looking for to contrast the striped lines on my living room walls. I was trying to figure out what color to do the closet and front door back. Voila! Here it is. What a lovely color. Really nice entry. Thank you. Thank you Lupe. Good luck with your space!